Our thermal wheels consists of a circular honeycomb matrix of heat-absorbing material, which is slowly rotated within the supply and exhaust air streams of an air handling system. As the thermal wheel rotates heat is picked up from the exhaust air stream in one half of the rotation, and given up to the fresh air stream in the other half of the rotation. Thus waste heat energy from the exhaust air stream is transferred to the matrix material and then from the matrix material to the fresh air stream, raising the temperature of the supply air stream by an amount proportional to the temperature differential between air streams, or 'thermal gradient', and depending upon the efficiency of the device. The airstreams should be flowing in opposite directions for maximum beneficial heat exchange to occur. The principle of course works in reverse and 'cool' energy can be recovered to the supply air stream if so desired and the temperature differential allows. The heat exchange matrix is manufactured in aluminium, which has good heat transfer properties. 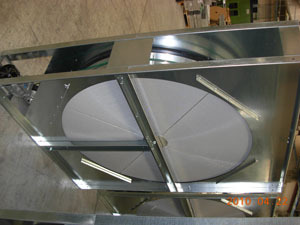 The heat exchanger is rotated by a small electric motor and belt drive system. 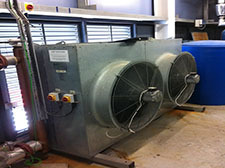 The motors can be inverter speed controlled for improved control of the leaving air temperature. 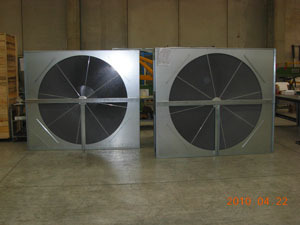 Because of the nature of thermal wheels in the way that heat is transferred from the exhaust air stream to the supply air stream without having to pass directly through or via an exchange medium, the gross efficiencies are usually much higher than that of any other air-side heat recovery system. The shallower depth of the heat exchange matrix, as compared to that say for a plate heat exchanger, means that the pressure drop through the device is normally lower in comparison. Generally a thermal wheel will be selected for face velocities between 1.5 and 3.0 m/s, and with equal air volume flow rates gross 'sensible' efficiencies of 85% can be expected. Although there is a small extra energy requirement to rotate the wheel, the motor energy consumption is usually very low and has little effect upon the seasonal efficiency of the device. In addition, the ability to recover 'latent' heat, depending upon the materials and coatings used, can improve gross efficiencies by some 10% to 15%. As well as standard aluminium, we also supply thermal wheels with either epoxy coated aluminium or hygroscopic material to remove moisture from the airstream. Casings are available in our standard Galvanised Steel or Magnesium Coated Aluminium. We also offer a stainless steel casing in 304 & 316 Stainless Steel. This can also be supplied as an insulated panel. 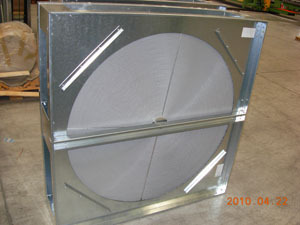 4d Air Products Limited introduces to our available coil geometries both 3/8" and 5/16" tube diameter coils. Where large batches of coils are required 3/8" and 5/16" is the most cost efficient option. Reduced set up times and automated brazing facilities significantly cut the cost of manufacturing batch coils.